Besides the crap they make you read in high school, a couple years ago I read my first real book. Yes, at age 23. Anyway, it was Slash's Autobiography and to this day is the best book I've ever read. The story of his life and Guns N' Roses was absolutely unreal and is a book I'm constantly telling people to read. 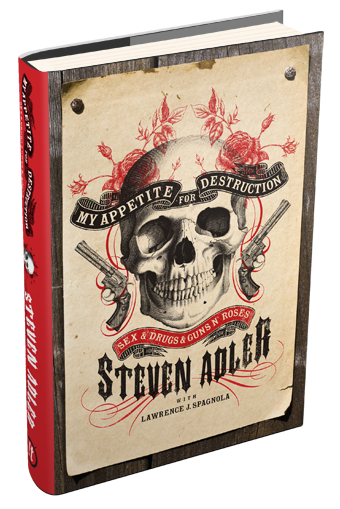 I'm a big Gunners fan but to be honest, I only read Steven Adler's autobiography for one reason. I wanted to see if Axl really was a bit of a prick. That was the picture that Slash painted with thinly veiled stabs at Axl in his autobiography so I thought I'd do what anyone in search of the truth would do. Find other sources. I turned to the original drummer from the band that did Appetite for Destruction and helped make Use Your Illusion before being kicked out ahead of recording. Plus, as much as I love their music, prior to these two books I didn't know too much about the history of GNR. This was an interesting read. A must for any GNR fan. This cat Steven Adler has had one hell of a messed up life. I thought some of the stuff Slash and Anthony Kiedis got up to (The only other two rock-star bio's I've read) was absolutely insane but Steven Adler's substance abuse was on another level. Some fascinating stuff in there.